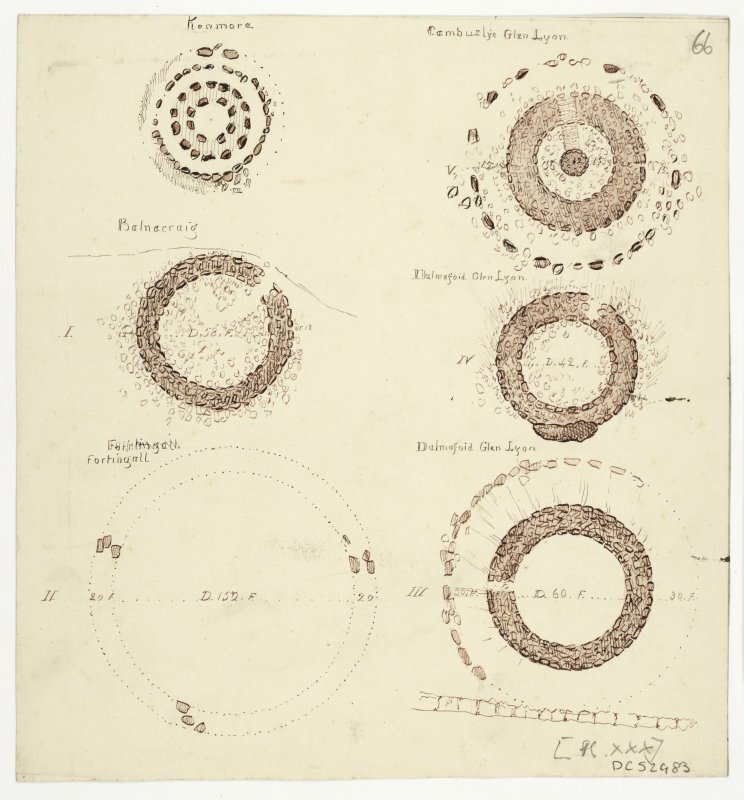 Plans of circles in Glen Lyon. View of Croft Moraig stone circle. Prof. Piggott Digital image of excavation. 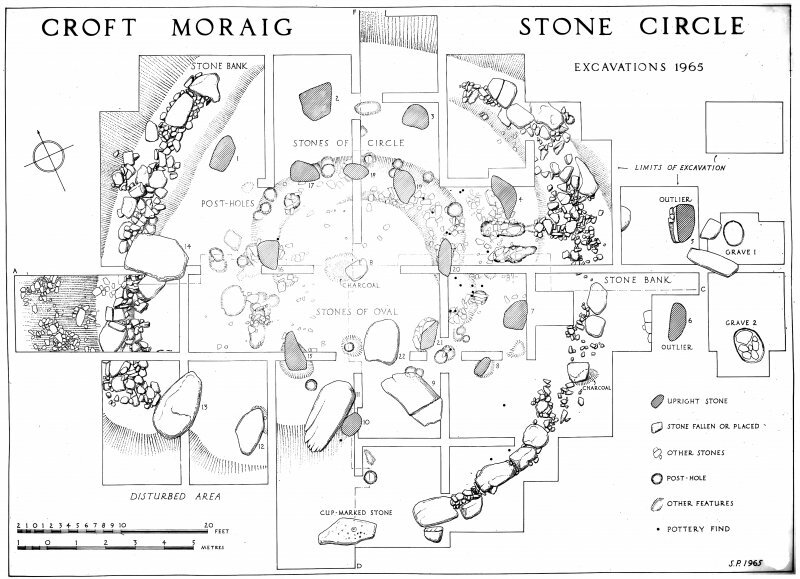 Plan showing the excavations at Croft Moraig. Glass negative. Not to be confused with NN74NE 146. 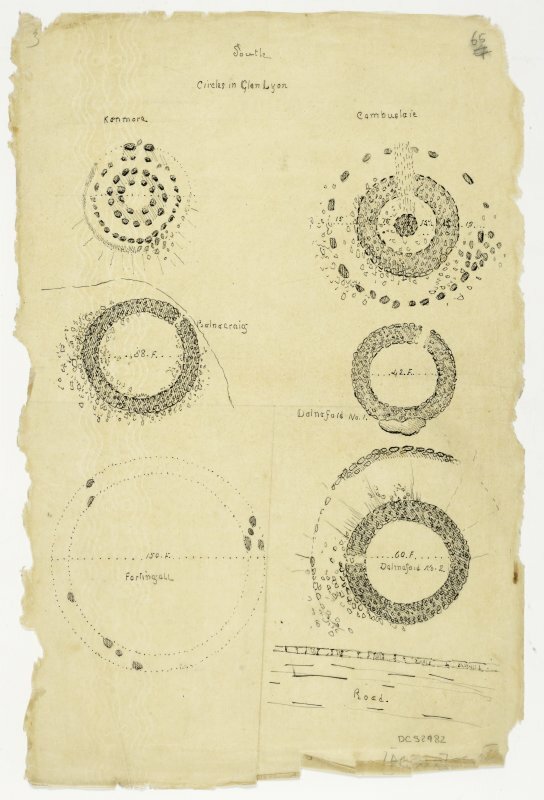 An unusual multi-phase stone circle as described by Piggott and Simpson. The finds from the excavations described by Piggott and Simpson were donated to the National Museum of Antiquities of Scotland (NMAS) in 1976-7 by the DoE. A proposed two-house development adjacent to Croft Moraig required an archaeological excavation. No archaeological features were found, most likely because the land here is alongside a burn and subject to both hillwash and riverine erosion. 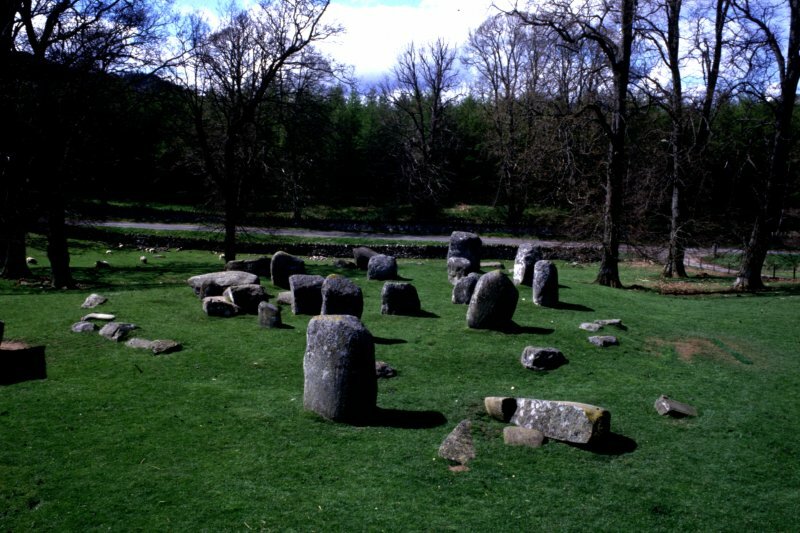 This setting oflarge boulders was excavated in 1965 and was shown to have a complex sequence of building and use comprising three main periods: a post setting of upright timber posts; a central oval arrangement of stones; and fmally the main stone circle, which surrounded the oval setting. One photograph shows the site in course of the excavation with ranging poles positioned in the horse-shoe shaped setting of post-holes; from the depth of the post-holes it can be estimated that the original timbers were probably about 2m in height At the centre of the setting there was a flat stone with a charcoal-filled hollow, perhaps a hearth. In the second period the timbers were forgotten and eight large boulders set up in an oval (6m by 7.6m) with three outlying stones on the southern arc; the ground surface on which the boulders were set had been carefuly flattened with earth, which contained quantities of neolithic pottery. The stones were erected in shallow sockets and were supported by packingstones around their bases. One stone in the north-east arc is decorated with several small cup-markings. The stones are all of similar size (between 1.4m and 1.6m) and are set on approximately the same axis as the earlier timber horse-shoe. Probably associated with this period is the outermost line of stones on the site forming a band of massive boulders and smaller stones, broken on the north-east and south-west. On the same axis as the oval setting there is a large slab, the upper surface of which bears about twenty-three cup-markings, two of which have partial rings. The last phase of activity on the site is represented by a circle of nine stones and two outlying stones; the circle also incorporates the three outlying stones of the earlier phase. The two impressive stones beyond the circle on the east-south-east imply a change of axis from that of the first two phases. Beyond the two stones, excavation revealed deep grave-pits, but the acid soil conditions meant that no burial remains survived. This interesting sequence may be compared to the various phases represented at Balfarg and Balbirnie (no. 93) and illustrates the range of ritual structures in timber and stone in the neolithic and early bronze age. 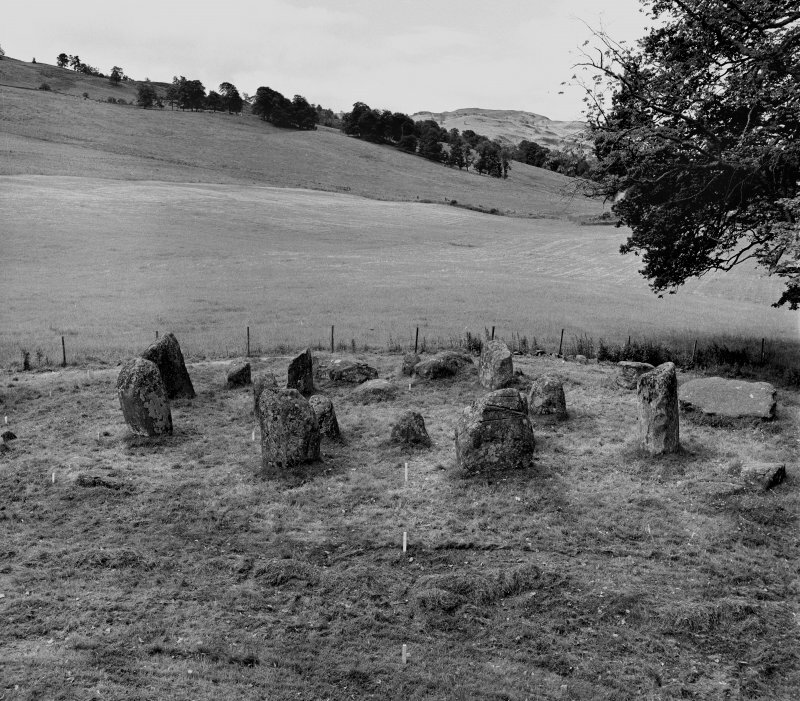 This well-known stone circle, which is situated on a low rise on the south-west side of the approach road to Croftmoraig, was extensively excavated in 1965 to reveal a complex sequence of superimposed stone and timber monuments (Piggott and Simpson 1971; Bradley and Sheridan 2005). To the visitor today it has four principal components. 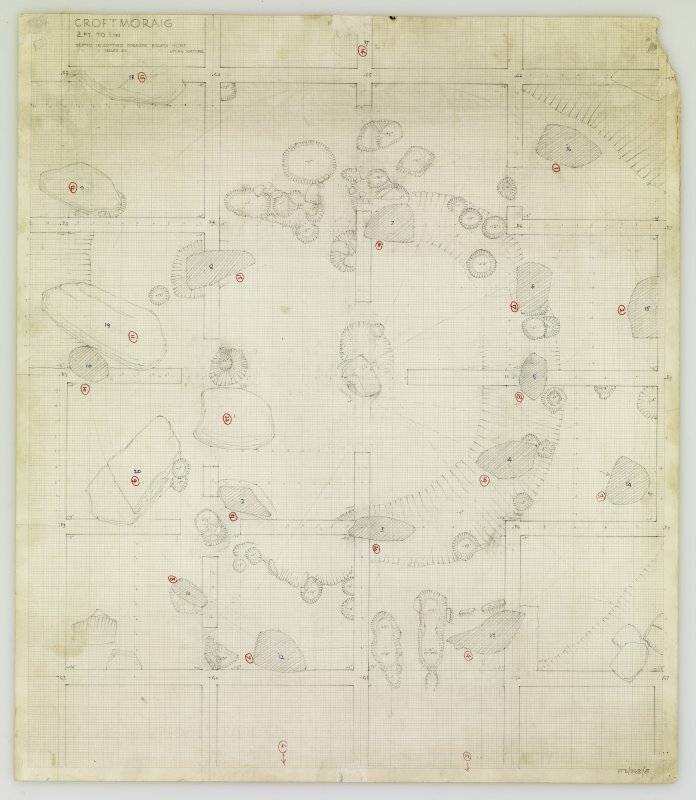 Working from the centre outwards these comprise: a central oval setting of eight low orthostats (Stones 15–22 on excavation plan; see plan, p 238) graded to increase in height towards the south-west and measuring about 6.3m by 5.5m; an outer circle of nine taller stones (1, 2, 3, 4, 7, 9, 11, 13 and 14) about 12.2m in diameter, which are interdigitated on the south with another three small boulders (8, 10 and 12); traces around the north-west, east and south of a sharply defined lip studded with boulders, one of them being a large prominently sited slab on the south-south-west bearing twenty-one cups and two cup-and-ring marks; and finally a pair of outlying slabs on the east-south-east (5 and 6), one of which is now fallen. The excavation uncovered a concentrically placed ring of timbers about 7.5m in diameter at the centre, accompanied on the north by an internal ring-ditch; there was a narrow porch-like entrance on the east-south-east. The only stratigraphic relationships that had survived later disturbance and stone-robbing demonstrated that the inner setting had succeeded the timber circle and the ring-ditch. 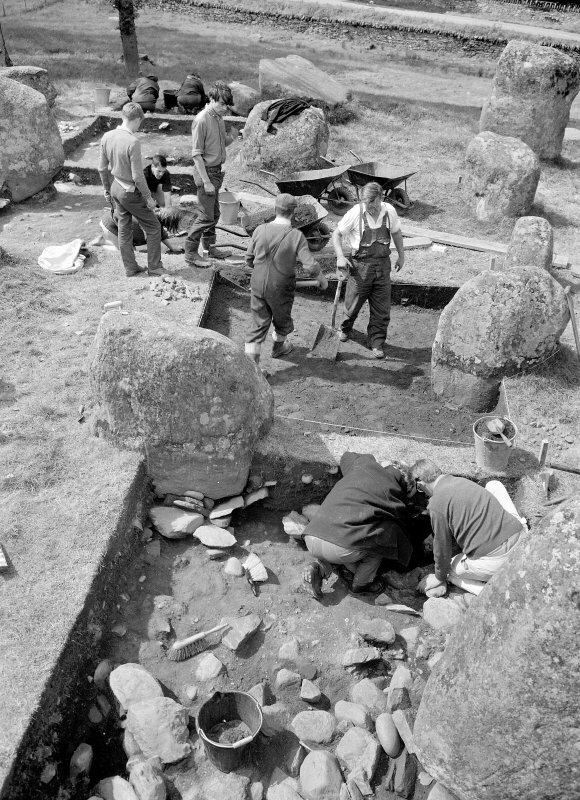 The excavators, Stuart Piggott and Derek Simpson, adopted what was then a conventional interpretation that placed the timber monument at its start, followed by the inner stone setting and the arcs of a stony bank forming the boulder-studded lip, and completed by the outer stone circle with its outliers forming a portal on the east-south-east; until recently this broad sequence has been generally accepted (Burl 2000, 249–51; 2005a, 157–8; Barclay 2000). Richard Bradley and Alison Sheridan, however, have reviewed the structural evidence and the finds from the fill of the ring-ditch, which included a few sherds of Neolithic pottery. These are now considered residual and they have suggested an alternative sequence in which the timber circle and the ring-ditch represent separate phases inserted successively into the interior of the outer circle and followed by the construction of the penannular setting and the enclosing arcs of bank (2005, 273, fig 3). Most of the sherds recovered from the ring-ditch are probably of Late Bronze Age date, thus providing a terminus post quem for the construction of the inner stone setting (ibid 278). In this new sequence, they contrast the east-south-east alignment of the outer stone circle and the entrance to the timber monument inserted into its interior, with the north-north-east and south-south-west axis of the inner stone setting, which they postulate was originally penannular with its open side facing south-south-west. They suggest that this apparent shift in the orientation of the monument is heralded by the digging of the arc of the ring-ditch, which was found only around the north-east half of the central area. Whatever the merits of this new sequence, which is discussed further below, the re-dating of most of the pottery finds to the Late Bronze Age is of some significance, with far-reaching implications for stone circles elsewhere. The present survey has been concerned principally with the evidence that Burl has advanced to suggest that Croft Moraig is a variant recumbent stone circle, but the commentary offered here has some bearing on the character and dating of both the inner setting and the outer circle, and is not wholly in accord with the new interpretation advanced by Bradley and Sheridan. In their examination of the axis of the monument they dismiss Barnatt’s suggestion that the orthostats of the outer circle may have been graded in height towards the south-west (2005, 269; Barnatt 1989, 316–18, no. 7:22) in favour of the major axis lying east-south-east and west-north-west through the portal formed by the two outliers. Of this latter axis there can be no doubt, extending through the gap between two stones 1.65m high on the east-south-east of the outer ring (4 and 7) and across to a tabular slab lying prone on the west-north-west (14). Measuring 2m in length by 1.4m in breadth, this is also the broadest stone in the outer ring. Measurements of the other fallen stones on the south-west quarter, however, show that these increase in length towards the south-south-west, where the longest stone (11) is no less than 2.8m in length, its neighbours (9 and 13) to either side being 2.3m and 2.45m respectively. While we do not know the depth of the sockets for the stones on the north side of the outer ring – Piggott and Simpson record only that they were shallow (1971, 8) – these three on the south-west would need to be sunk between 0.9m and 1.4m below the present surface to reduce them to the height of the two standing on the north-north-east (2 and 3), both of which are 1.4m high. At this depth it is inconceivable that the sockets would not have cut the subsoil, and yet the only ones located in the south-west sector of the ring belong to the small intermediate boulders. Thus, though the two outlying stones provide an axis to the outer circle lying east-south-east and west-north-west, there can be little doubt that the orthostats of the outer circle were graded in height around an axis lying north-north-east and south-south-west. Piggott and Simpson attributed the loss of the sockets on the south-west to extensive later disturbance, which they believed was also responsible for the removal of the much misunderstood ‘stone bank’ in this sector (ibid 8). 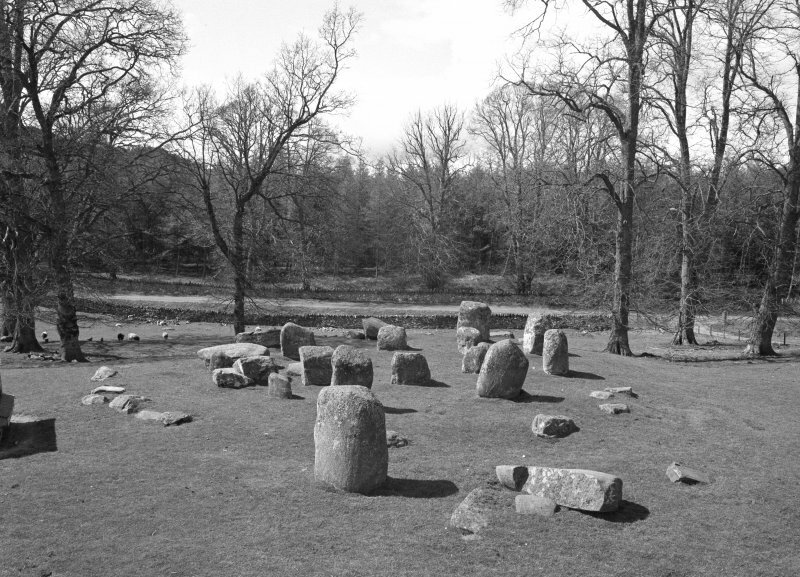 The apparent eccentricity of this feature to the outer stone circle, has led most researchers to associate it with the inner setting rather than the outer circle (Barclay 2000), but this forgets that it was heavily robbed (Piggott and Simpson 1971, 7–8). As Alexander Thom demonstrated many years ago, the larger boulders surviving along its course are roughly set along the circumference of a circle (Thom et al 1980, 348–9), so much so that these should surely be interpreted as the surviving kerbstones of a much more regular and formal structure. Some of the boulders were founded on the bank of rubble, and as they appear today they form a roughly level rim encircling the monument. As such, they were probably designed not to retain the bank so much as create a formal edge to a level platform, and if the size of the cupmarked stone on the south-south-west, a slab over 2m in length, is any guide, the largest of these kerbstones may have been placed around the south-west quarter. Any eccentricity between the kerb of the platform and the outer stone circle, which can only be judged on the projection of the surviving arcs, was again on this same axis, the gap between them being narrowest on the north-north-east and broadest on the south-south-west. If this platform is reinstated across the south-west quarter of the circle, it at once suggests why no stone-holes were recovered in this sector, for the sockets were probably contained within its thickness, though in its turn this implies that the orthostats of the outer circle were erected after the platform was constructed. To some extent this hypothetical sequence is confirmed by photographs in the excavation archive. These show the packing stones of the standing orthostat on the east of the outer ring (4) rising almost to the turf (eg RCAHMS PT10193) and thus above the level at which ‘flat or roughly flat stones’ were found on the surface of the material that filled the earlier post-holes and the arc of the ring-ditch (Piggott and Simpson 1971, 6–7). This scatter of stones was probably the residue of the robbed platform, and the position of the packing indicates that the socket for the orthostat was cut through it. Some years ago such a sequence would have appeared unlikely, but now it is more normal, conforming to the sequences that Bradley (2005) has recovered in his excavations of the recumbent stone circles at Aikey Brae, Cothiemuir Wood and Tomnaverie. If this analysis is correct, however, the timber structure reverts to where Piggott and Simpson placed it, at the beginning of the overall sequence of construction, sealed beneath the platform. The only possible evidence that there may have been a stone setting here before the construction of the platform is provided by the shallow sockets in the subsoil for two of the small stones apparently interdigitated with the orthostats of the outer circle on the south. As for the timber structure itself, there is no satisfactory evidence to detach the ring-ditch from the post-ring; as Bradley and Sheridan hint (2005, 279), if these were found without the association of a stone circle, unquestionably they would be conflated as the remains of a Bronze Age round house with a partly sunken floor and its entrance on the east-south-east; examples can be found throughout eastern Scotland (eg Kintore; Cook and Dunbar 2008). The same commentary is presented elsewhere in this volume in respect to the wall-trench and post-ring excavated within the recumbent stone circle at Strichen House, though in that case the building was inserted into an existing stone circle. The filling of the ditch at Croft Moraig may have taken place within the history of this building rather than with the construction of the platform (eg see Achany Glen, Lairg, House 2, McCullagh and Tipping 1998, 38–40); at any rate the sediments had certainly consolidated before the erection of the stones of the inner setting, for none of these shows any signs of subsidence. Piggott and Simpson assumed that the inner setting of stones was oval rather than penannular, based upon the large stone lying prone in its open arc on the south south-west (22). They failed to find its socket, but the robbing of the platform readily explains its loss, and probably why most of the others had only the shallowest seating. With all of these stones bar one upright, however, the alignment of the setting is plain enough; their tops rise progressively towards the south-south-west. Furthermore, a line drawn through the smallest stone on its north-north-east (18) and the middle one of the three interdigitated with the outer circle on the south-south-west (10) passes through the centre of the cupmarked slab on the kerb of the platform, if not the cup-and-ring on its upper surface (Bradley and Sheridan 2005, 272), combining elements probably belonging to three separate phases. And yet the inner setting also references the east-south-east alignment of the outer circle in its short axis, and more precisely than the entrance into the earlier timber building; this is manifested in the positions of the two stones on its longer arcs (16 and 20), which are set roughly on a line drawn from the fallen tabular slab on the west-northwest of the outer circle through the portal on the east-south-east. Burl has also recognised the presence of the platform here and has marshalled it with the ‘supine’ cupmarked stone on the south-south-west, the pieces of quartz found scattered across the interior (Piggott and Simpson 1971, 8), the grading of the inner orthostats, and the apparent orientation of the inner setting towards the south-south-west, to argue that in its later stages Croft Moraig is a variant recumbent stone circle (Burl 2000, 249–51; 2005a, 157–8). As we can now see the south-south-west is also referenced in the grading of the outer circle and the platform. That said, the circle has never borne any resemblance to a recumbent stone circle at any stage of its development into the composite monument that survives today. These are simply elements in a shared vocabulary that turn up in different ways throughout the country. As is the case where Burl has postulated other long distance links (Auchagallon NR83SE 1; Coilleaichur NN84NW 24; Fortingall NN74NW 3; Torhousekie NX35NE 14, there are more likely comparisons to be found at much closer hand. What is perhaps most remarkable about Croft Moraig is that the Late Bronze Age pottery apparently provides a terminus post quem for every stage of its megalithic development. NN 7975 4726 The aim of the excavation undertaken July – August 2012 was to check details of the site sequence at Croftmoraig and to obtain samples for AMS dating. As 90% of the site had been excavated in 1965 the 2012 excavation focused on the unexcavated baulks between some of the trenches, and on contexts where the presence of charcoal had been recorded by Piggott and Simpson. The new work involved four small trenches. The first sectioned the rubble perimeter of the monument which is interpreted as the foundation for a wall. The second examined the site of a ‘hearth’ recorded by the previous excavators in the centre of the monument. The third investigated small areas of surviving stratigraphy in a penannular gully discovered during the earlier project, whilst the fourth excavated part of a shallow pit extending beneath a displaced block belonging to the perimeter wall. Charcoal samples were recovered from all four areas and are currently being identified. It is hoped that they will be suitable to resolve current uncertainties about the structural sequence on the site and its absolute chronology. NN 79820 47280 A watching brief was carried out, 13–14 April 2017, during topsoil stripping in advance of construction of a house close to Croftmoraig Stone Circle. Nothing of archaeological significance was encountered. NN 79795 47225 – NN 79846 47295 A watching brief was undertaken, 13–15 March 2017, during replacement of an overhead powerline with an underground cable in advance of construction of a house close to Croftmoraig Stone Circle (NN74NE 12). Nothing of archaeological significance was encountered.